11.20.10 One hundred eight players competed in the Sixteenth Boston University Open held at BU's George Sherman Union on November 6th, 2010. The tournament ended in a four-way tie for first between IM Robert Hungaski, FM William Kelleher, NM Alex Fikiet and Andrew Wang. Seven Maine players, all from Cape Elizabeth, participated in three section of the tournament. Each Mainer had a good day and all gained rating points. 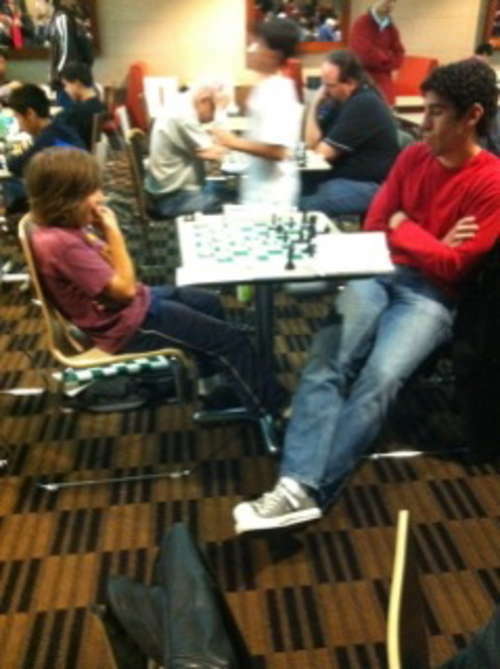 Here's images from the event, the USCF crostable and a selected game. Maine was well represented at the Boston University Open. 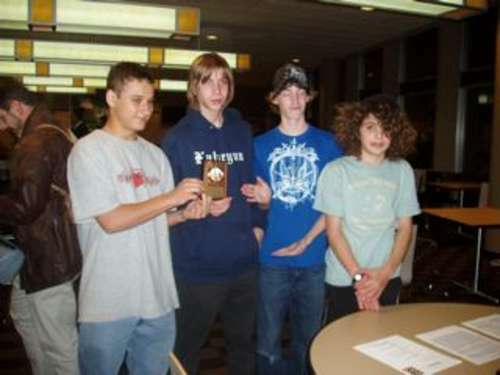 Here Matthew Fishbein (far left) and Matthew Reale-Hatem (light blue t-shirt) can be seen in the tournament room. Thanks to Mark Parker and Bob Oresick for contributing to this report. Our apologies for the low quality of some of the images. Cape Elizabeth players took the title of Top High School scoring 6.5 points. Individual scores were: Benjamin Hansel 2.5, Colin Smith 2.0, Matt Reale-Hatem 2.0 and Brett Parker 2.0. Matthew Fishbein scored 1.0 point and gained two rating points in the very competitive Open section. 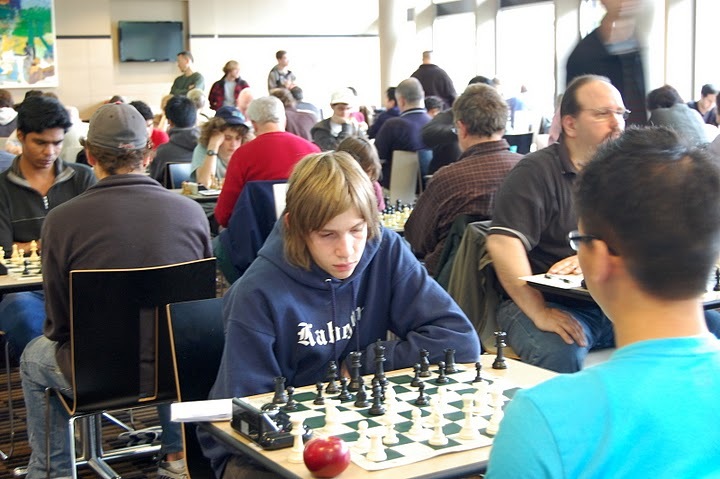 After losing his first game Wesley Parker came back with a vengence to take three straight and finish tied for second place in the U1900 section with 3.0 points. Matthew Reale-Hatem and Brett Parker each scored 2.0 points in the U1900 section. Ben Hansel scored 2.5 points in the U1600 section and received the top U1400 player award. Colin Smith and Jasper Hansel each scored 2.0 points in the U1600 section. Congratulations to the Cape Elizabeth players on their fine performances. When all was said and done Cape players walked away with a combined ratings increase of 279 points! Bill Kelleher (right) notched his fifth BU Open title. Maine's highest-scoring player, Wesley Parker (left), tied for second in the U1900 section with 3.0 points. Colin Smith takes a look at his neighbors' game while waiting for his opponent. A few luminaries were on hand including the great GM Larry Christiansen (left). Matthew Fishbein (right) considers his position while on the move.